After clicking the button, you’ll see pop-up menu with samples of color schemes. Move the cursor to previously see the color scheme of the current slide. Select the color scheme you need by clicking on it. Changes will be applied to every slide of your presentation. Select “Design” tab at the top toolbar. In a pop-up tab the big field with “Variants” preview represents color themes “Colors”. 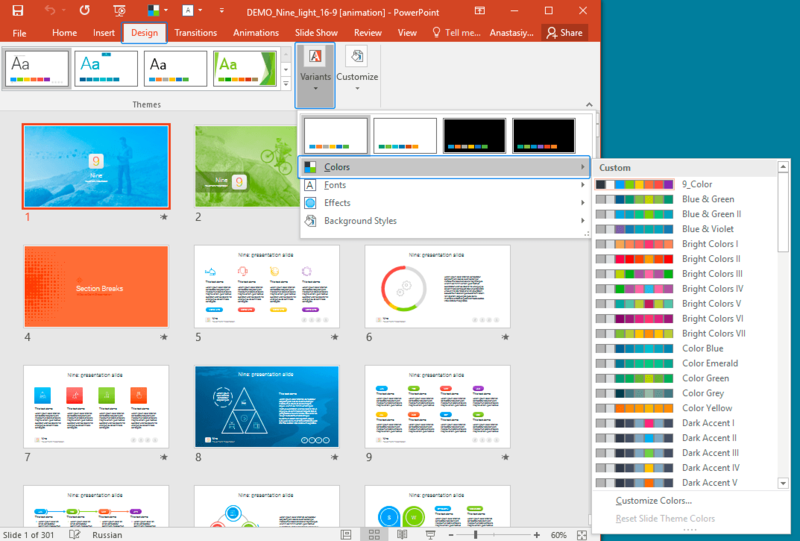 Use “Colors” button to preview the results of the color scheme changes (by pointing) or click on the theme you need to apply it for every slide of your presentation. In the slide master editing mode (View>Slide Master) at the top toolbar you’ll find “Colors” button. Use it to preview a result of the color scheme changes (by pointing) or click on the theme you need, to apply it for every slide of the presentation. When changes done, click “Close Master View” in the top menu.